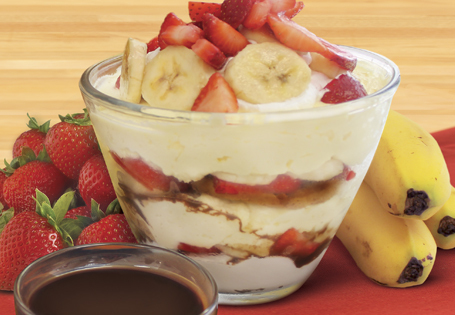 A lightened up mousse with the flavors of a banana split. Preheat oven to 400°. Use a serrated knife to slice waffles in half like a sandwich. Place waffles on a baking sheet and bake for 10-15 minutes or until crispy and golden brown. Let cool, then break into pieces. In a medium bowl, whisk together vanilla pudding mix, yogurt, milk and vanilla. Mixture will be thick. In a clear serving dish or individual bowls, make a layer with 1/3 of the waffle pieces, drizzle with 2 tablespoons chocolate syrup, top with half of the mousse, then half of the strawberries and bananas. Repeat the layers one more time. Garnish with whipped topping, if desired, and remaining waffle pieces.